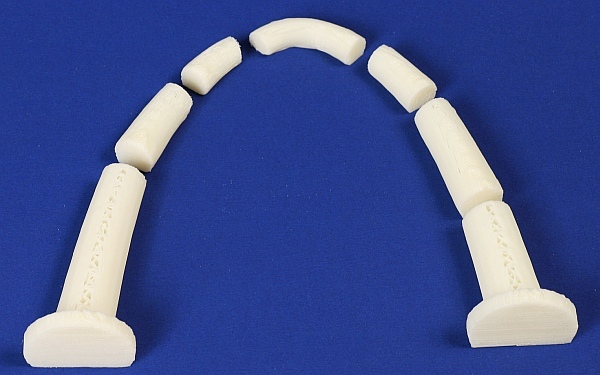 Here is a seven-piece arch in the shape of a catenary, similar to the Gateway Arch in St. Louis. If you have access to a 3D printer, you can make the pieces using the files available here. A previous Math Monday column showed how to make large scale arches from cardboard and some science museums have exhibits of wood blocks you can assemble into an arch. 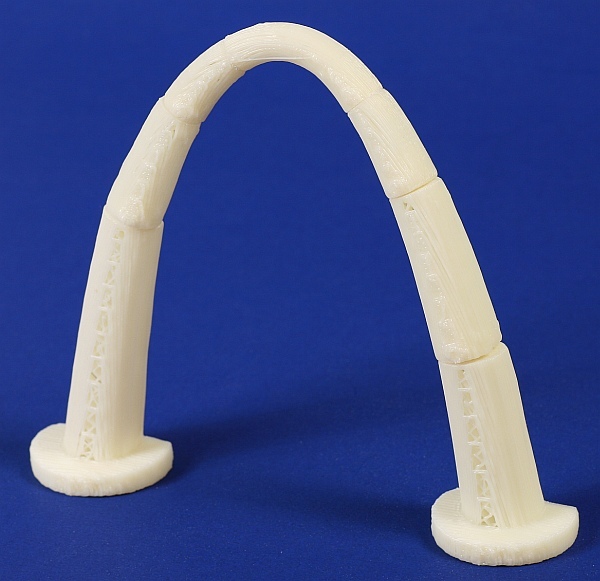 What is different here is that I broke the arch up into irregular, asymmetric pieces built on a small 3D printer. The key property of a catenary is that it is the shape of a hanging chain, so it forms a curve where the parts are only in tension, with no sideways forces. Turning this curve over and cutting slices perpendicular to the tension direction results in joints which again have no sideways forces, so there is no reason for it to slide apart. Despite the mathematical properties of an ideal catenary, it is still a challenge for one person with only two hands to put this physical model together. So I made the back of the shape flat, because it is easy to build if you first build it flat on a piece of cardboard, then tilt it up to a standing position. This article first appeared on Make: Online, October 31, 2011.